Last night, my daughter Harley saw Bruce Springsteen and the E-Street Band live for the first time. It broke my heart a little that the Big Man and Danny Federici weren’t going to be there, and for the first time, I didn’t do my usual prep for a concert. I didn’t study setlists, read articles about the other shows on the tour, or cram by listening to every song ever recorded by Bruce and The Band. We wondered if she’d get to experience Tenth Avenue Freeze-Out, Badlands, Jungleland, and Born to Run, and how we’d feel about someone else playing Big Man’s solos if those songs were performed. She asked me if I thought I’d cry. Throughout the show, I kept looking for Big Man and Danny. (See Kubler Ross’ 5 stages of grief…especially denial.) We didn’t see them on the stage, but they were there. I closed my eyes and I heard them. Felt them. Finally, during Tenth Avenue (aka “Roll Call”), it happened. “Now this is the important part,” he said, and sang, “When the change was made uptown….” As he repeated that line gently, pictures of Clarence floated across the huge screens. 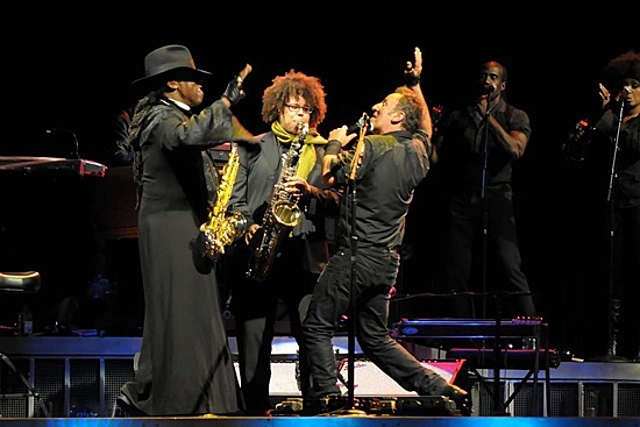 Jake Clemons (C’s nephew) made his way out of the horn section as the Boss sang, “AND THE BIG MAN JOINED THE BAND!” I thought he played this solo (and the others throughout the night) perfectly, which is exactly what we needed. I know I appreciated that Jake didn’t improvise–that Miss Harley was able to hear it live, exactly as C would have played it. As always, if you enjoyed this post, please like, share and/or comment. Pleeeeeease?? Gary and I were big fans of The Boss. And Gary especially liked big Clarence. Actually “Born to Run” was “our song”. Not very romantic, but fit us at the time. Gary could sing all of Bruce’s songs and sounded very much like him. Lot of memories with the Boss. And so glad that another generation can love him too. Great story. Makes you wish the Beatles were still together (and alive). Some really great artists are gone now. But as you well stated, alive in our memories. Born to Run is VERY romantic!! I’m so sad I never got to meet your Gary. But so happy to have met you. Thanks for feeding Lois lunch today, by the way! OMG was Matthew Witte playing the Sax that night??? ?Ha!